Three lagoons – Each “clean” lagoon has a capacity of approximately 2.4 million gallons. 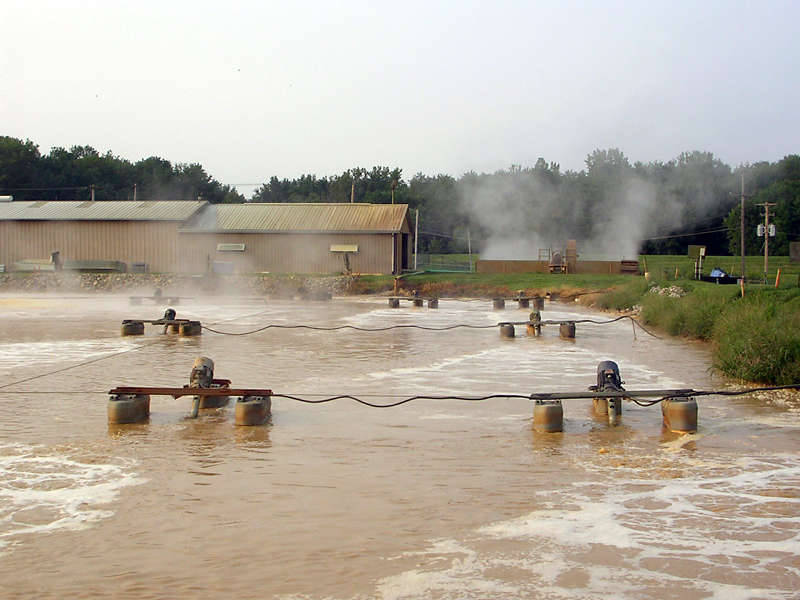 Part of the return activated sludge from the clarifiers is discharged into the fully aerated (primary) lagoon. In an effort to improve the performance and treatment capacity of this plant, the cheese processor hired ATI in early 2007 to perform an evaluation, which suggested the following upgrades. ATI completed the drawings in March 2008, and construction was completed in July 2008. Modifications to the equalization tank to improve wastewater equalization and reduce the hydraulic retention time of the wastewater. Removal of the current mechanical aerators and installation of a new floating-lateral diffused aeration system for the primary lagoon. This will allow more efficient transfer of oxygen to the microscopic organisms, increasing BOD and TKN removal. Installation of a new secondary clarifier to increase the solids loading capacity and allow for better solids capture. Installation of a new tertiary filter system to polish wastewater to meet required phosphorus permit limits before discharge.